I can’t believe I’m just now getting around to posting this for everyone. If you follow me on my personal Facebook page, you know I’ve been sharing my weekly grocery hauls for at least a couple months now. 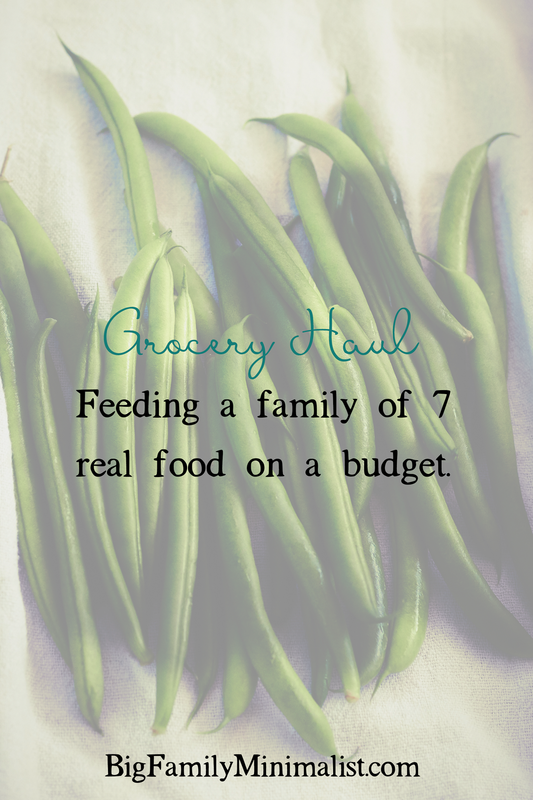 I get lots of questions about how we feed our large family on a budget, especially when we are a totally gluten-free household and we don’t do a whole lot of processed foods. Now, let me be very clear, what we eat isn’t perfect. Far from it, really. But after two years of anxiety and fighting with it, I feel pretty confident in the food choices I make for my family. I’ve accepted that we’re doing the best we can while maintaining a budget. Trust me, last summer when four out of five kids were gone for six weeks, I shopped like I WISH I could all the time. 100% organic, great quality everything…and for two adults and a toddler, I spent about the same (actually, a bit more, I think) than I generally do buying for our whole family. So, while I know we *could* buy better in many areas (organics, etc), I have accepted what we can actually afford right now and prioritized accordingly. From week to week you’ll see some differences if I get a great buy on organics or come across some great local meat options. So, let’s jump into it! First, here’s the Facebook Live that I did on Saturday when I got home from shopping. Now, I want to break down what I bought for you because I know that when I’m obsessively curiously watching other people’s haul, that’s something I really like to see. Prices aren’t the same everywhere, so it’s helpful to see the ratio of how much of their budget is going to meat versus produce, etc. Honestly, it’s right up there with wondering what they actually make with everything to feed their family! Phew! That was a lot, huh?! So we’re well under my normal budget of $200/week. I felt like we did really good. In case you’re wondering, we budget for things like dog/cat food (and supplies), cleaning/laundry, and personal care all separate. I like to know exactly what I’m spending on food. Food is really the area where I’m in danger of over-spending, not so much on the rest of it. On Monday we had a family outing to Belle Isle and decided to pack lunches. But instead of packing what we had at home, I decided to swing by Aldi on our way out and just grab some stuff. I still think this was the right idea because we hadn’t done this in awhile and I remembered correctly that my kids eat like monsters when we have a picnic. That said, I was shocked to see my total at the register. But we were able to bring the leftovers home to add to the stock for the week, so it’s a win I think. And of course, it’s less than if we’d eaten out, and healthier, too. We also spent about $8 on paper plates, plastic cutlery, and sandwich bags to restock our picnic bag that we depleted last year. When all is said and done, we’ll be doing a lot of picnicking this year. We don’t have enough reusable lunch containers to go around and I’m loathed to haul around that much pyrex for the day, which is what we use around the house. Only our oldest has her own PlanetBox and it hasn’t been in the budget to get them for the other four kids (or Josh and me). I think it’s time to really look into a long-term solution for this. I realize it would have been so much easier if I could have packed them each a lunch box for this trip. As a homeschool family, this is the first year my schedule is going to allow for a lot of day-trips, so even now there’s a learning curve! finding quick, simple meals that make us happy but aren’t a burden as we go into baseball season. I feel like our family has a lot of things coming to head at once. Four out of five kids are starting baseball and my work schedule has really picked up, including a heck of a lot of travel. We want to stay healthy and crack down on the budget more, but it’s become equally as important that our meals are efficient. The current meal plan we’re using focuses on using a lesser amount of fresh ingredients that are used in different ways throughout the week, including batch cooking some of your proteins for use in later meals. I love having a prep list right in front of me so that in the afternoon I can spend a few minutes chopping and prepping while I wait for my lunch to heat up. This way when Josh gets home, he can easily assemble dinner. We seem to go in bouts with our meal plans. We’ll use one for a month or two and then switch to another, then spend a few weeks totally DIYing it. I don’t know why, but that’s just how we are. Also, I sit down with the grocery ads for Aldi, Fresh Thyme, and Kroger each week when I make our list. And of course, my price book spreadsheet that includes Costco and Plum Market. I am going back to doing the bulk of my shopping at Aldi, and only going to the others if something is cheap enough to warrant the extra time and drive. Or I simply can’t get it at Aldi. Like this week, there was no way I was going to get ginger root, jicama or shallots at Aldi, so knowing I was going to go to Fresh Thyme anyway, I waited and got my green beans there since I knew they’d be cheaper by $0.30/lb. If I wasn’t already driving over there, that wouldn’t have been enough reason to go on its own. I’m thinking that I may try our Farmer’s Market this week, we’ll see!